The Forgotten World Highway is a 150 km highway between Stratford and Taumarunui. It’s more than just a road linking one town to another, it’s a full experience, complete with heritage, and insights into history. The trip is windy, slightly mysterious and the views of unspoiled native bush are spectacular, it’s rare to find land so untouched by the modern world. This secluded road has many noteworthy stops to take along the way. It winds over four mountain saddles, alongside Tangarakau gorge and through a 180 metre single lane tunnel. The Forgotten World Highway was opened in 1945 after 50 years in the making. Your first notable stop is Strathmore Saddle, this is the first of the four saddles. On a clear day the view of all four mountains - Taranaki, Tongariro, Ngauruhoe and Ruapehu are simply exquisite. You’ll find picnic tables here so if you’re planning a snack stop this one will offer you an unbelievable backdrop. Whangamomona remained under Taranaki, the other half under Manawatu-Whanganui. The locals weren’t impressed so responded by declaring their independence. As you can imagine, the locals of Whangamomona possess a great sense of humour and don’t take themselves too seriously. After a pleasant stop in Whangamomona, you’ll reach Tahora Saddle. The last saddle of the highway, it overlooks mountains, railway tunnels and three Māori Pa sites. Continue on to the 180 metre long Moki Tunnel. Known by locals as “Hobbit’s Hole” the tunnel was built in the mid 1930’s. This is usually a child’s favourite part of the trip with it’s magical, novel nature. Not something you get to drive through everyday. Hopefully you’re not in any hurry to complete the drive because Mt Damper Falls is a slight detour, 15 km down Moki Road. This stop will be absolutely worth your time. A 20 minute walk will take you to the North Island’s second highest waterfall (74 metres). Please note that access to the falls is via private farmland and the track is closed from 1 August - 31 October. Once back on the highway, you’ll reach the Tangarakau Gorge section of the Forgotten World Highway, it is gravel road for 12 km so do drive with care. 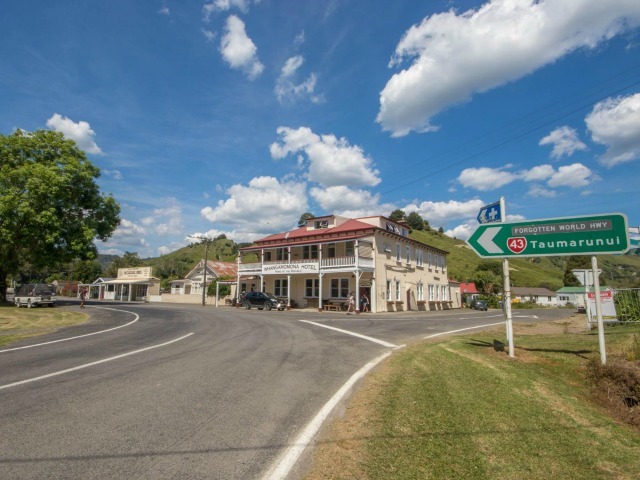 Approximately fifteen kilometres before you reach Taumarunui, take the time to stop in at Lauren’s Lavender Farm. The relaxing surroundings of lavender fields and farmland are a nice place to stop before the end of your journey. During the summer months visit the cafe in an old converted farm house for a bite to eat and a coffee. 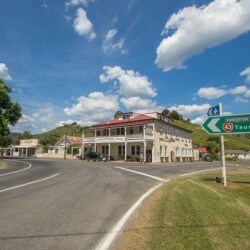 Taumarunui. The end of the Forgotten World Highway. This small town in the Ruapehu district is rich with Māori history and many local activities to keep you busy. However, they say it’s not about the destination, but the journey. The Forgotten World Highway certainly delivers an unforgettable journey, like none you will have taken before. Do I need a full tank of gas? Yes. Because the Forgotten World Highway is so remote, there are no petrol stop along the 150km route. Too be safe make sure you fill your car up with gas before attempting the journey. This will ensure you have enough to make it to the next gas station while still having the opportunity to venture down the main side roads along the way. The drive time itself is approximately 2 hours 15 minutes. However with all of the attractions to see along the way we recommend you give yourself the full day for the journey. They should be fine, the tunnel is 4.5 metres high so check before you set off. Yes. The distance and terrain mean this journey is best completed over 2–3 days, which will allow time to soak up the scenery and heritage sites off the bike. Remember, the road is long and windy so only attempt to cycle it if you have experience.